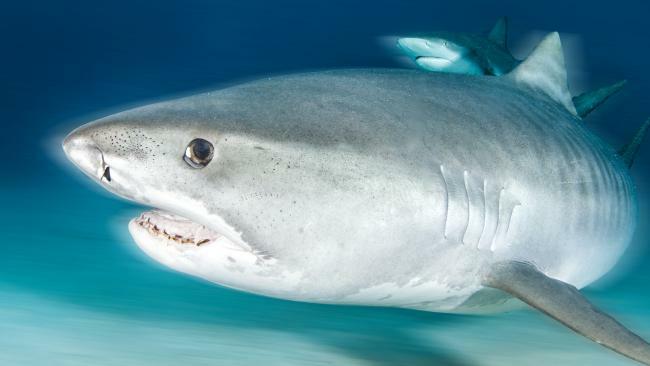 Four Tiger Sharks have now been pulled from Cid Harbour. 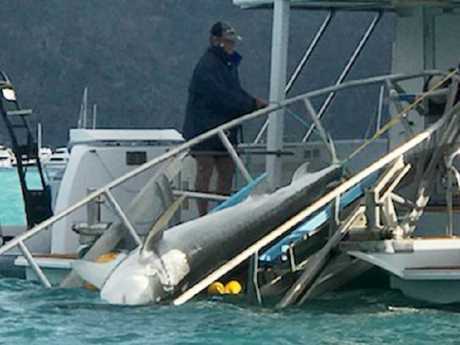 THE State Government will look into how best to warn people after yachties revealed they had no idea the first shark attack had occurred in Cid Harbour. Tourists anchored in the popular holiday spot have told how they spotted a rescue helicopter but had no idea Tasmanian mum Justine Barwick had been mauled. Others said they were swimming in the popular Whitsundays harbour the following day - with no knowledge of the first attack - when Melbourne schoolgirl Hannah Papps became the second victim. Fisheries Queensland installed baited drumlines and warned swimmers out of the water after the second attack. Four sharks - all tiger sharks - had been caught and killed by yesterday afternoon. The fourth measured 3.7m in length. A 3.7m tiger shark pulled from Cid Harbour on Sunday. Hannah, 12, remains in a critical but stable condition while Justine, 46, continues to improve after a marathon 18-hour surgery to save her leg. A statement released on Sunday on behalf of Justine's family said she was awake and communicating and her condition continued to improve. "This morning Justine is conscious and no longer being ventilated," her husband Craig said. "She is communicating using thumbs up, nodding and best of all smiling! "We are very impressed with the Queensland Health Service and the wonderful staff at the Royal Brisbane and Women's Hospital, in particular the surgical team and intensive care unit." Justine will remain in intensive care for the next few days before being moved onto a ward. Boaties told The Courier-Mail that some people had no idea the first shark attack had occurred and continued to swim in the harbour. Graham McLaughlin was on board one of 12 yachts travelling together. Included in the group was Mackay trauma doctor John Hadok, who provided lifesaving treatment to Justine. Mr McLaughlin raised the issue of warnings following the first attack, saying "not everyone has the radio on" while anchored in the harbour. "You'd think you'd soon get word around that there's been a near fatal shark attack here and don't go out in the water here," he said. Another boatie, who didn't have his radio on, said he was a "bit p****d off". "I was swimming there. That could have been me attacked," the man, who didn't want to give his name, said. With Cid Harbour being a remote location - as opposed to a patrolled beach - it was unclear who would be responsible for warning swimmers about a recent shark attack. And boats that have been out at sea may not have heard that an attack had occurred. A spokesman from the Premier's office said their first priority was the health of the victims but the subject of warning systems would be looked at.